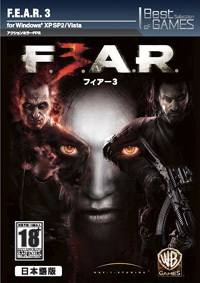 F.E.A.R. 3 software (C) 2011 Warner Bros. Entertainment Inc. Developed by Day 1 Studios, LLC. Uses Bink Video. Copyright (C) 2007-2011 by RAD Game Tools, Inc. Licensed Developed Software uses Havok(TM) (C) Copyright 1999-2011 Havok.com Inc. (and its Licensors). Portions of this software are included under license (C) 2011 Scaleform Corporation. Uses FMOD Ex Sound System provided by Firelight Technologies. RakNet(TM) copyright (C) 2002-2011, Jenkins oftware. All other trademarks and copyrights are the property of their respective owners. All rights reserved. 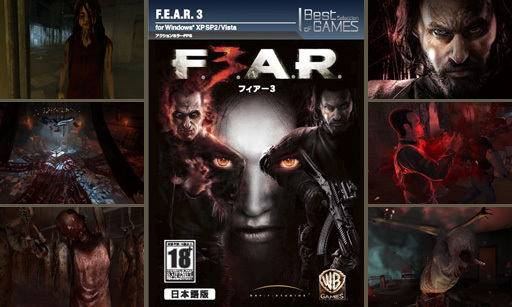 F.E.A.R. and all related characters and elements are trademarks of and (C) Warner Bros. Entertainment Inc.
WB GAMES LOGO, WBIE LOGO, WB SHIELD(TM) ＆ (C) Warner Bros. Entertainment Inc.